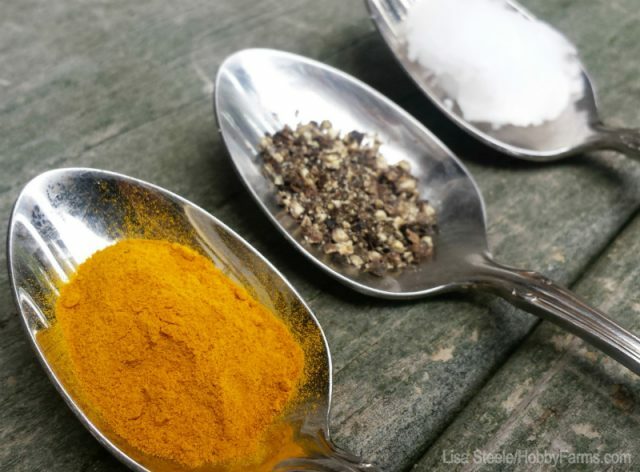 Curcumin, the key ingredient in turmeric, alongside many other important ingredients, offer many health benefits because they are potent antioxidant, anti-inflammatory, antiseptic, anti-fungal, and anti-bacterial agents. Turmeric supplements are available in capsules, tincture or liquid extracts. On the other side, pepper apart from being used to season food, it is also used for medical purposes. Its key chemical is piperine, which is similar to capsaicin, the chemical in chili. Both curcumin and piperine are health beneficial. Black pepper improves bioavailability of turmeric because most of the ingested curcumin gets metabolized before it can get absorbed. This boosts the amount of any drug or supplement that can be absorbed by the body. Piperine in black pepper can cause TRPV1 in the body, which leads to reducing pain in the body. Piperine is also used as an analgesic cream that you can apply on your skin to relieve pain. There are many studies that are using piperine to kill chronic pain, neuropathic pain in particular which is untreatable. Other studies examined curcumin’s anti-inflammatory properties in treating rheumatoid arthritis, ulcerative colitis and other inflammatory conditions. Also, it can be used as an anti-arthritic agent. Moreover, piperine and curcumin have been examined for their benefit to prevent breast cancer. These two compounds inhibit mammosphere formation. Also, they don’t trigger toxicity, showing they can act as cancer preventive agents. Cancer cells can reappear even after chemotherapy. This occurs because cancer stem cells still exist and can cause reappearing of the tumors. Studies have showed that the combination of turmeric and black pepper could target breast stem cells. Both compounds don’t affect normal breast tissue. In a study at the University of Michigan, cancer cells were injected with a powerful solution of piperine and curcumin that was around 20 times stronger than what is normally consumed through food. The combination of turmeric and black pepper can fight high cholesterol levels, obesity and diabetes. It can change blood glucose, body weight, bad cholesterol and triglyceride. CPQ means combination of curcumin, piperine, and quercetin (got from onion skin). CPQ’s flavonoids are responsible for many reactions like lower glucose transport. Turmeric and black pepper could relieve gastric mucosal damage caused by peptic ulcers. These two ingredients have antioxidant benefits, which mean they can improve memory loss and protect people from cognitive impairment from neurodegenerative diseases. Depending on the medical condition, the dosage of turmeric varies. Just like most herbal supplements, turmeric has no specific dosage you need to follow. The usually recommended dosage of dried turmeric powder is 1-3 grams daily. For supplements – 400-600 mg, three times a day. Black pepper can easily be added into your diet in curries, salads, and dressing. You should not consume more than 1 teaspoon daily when certain medications like digoxin or phenytoin are taken. If black pepper is consumed in excess, the rate of clearing these medications by the liver could be reduced. Turmeric as a spice is considered to be safe. Turmeric supplements should not be consumed in excess and for an extended period. It can lead to indigestion, dizziness, diarrhea, or nausea. Pregnant women and those who are breastfeeding should avoid all types of herbal supplements. Stop using turmeric supplements if you are a diabetic, due for surgery and have gallbladder problems. Finally, if you suffer from specific medical issues and are not sure about using turmeric and black pepper, consult your doctor.